We are sitting in the car in a carpark outside a Long's Drugs store in Eureka, where they are busy burning the photos from the digital camera to a CD, and have been going at it for over an hour now. We still have to drive up to as far as Crescent City tonight. We woke up fairly early, especially considering we lost an hour to daylight savings overnight. We showered and had brekky and were ready to go before 9am. 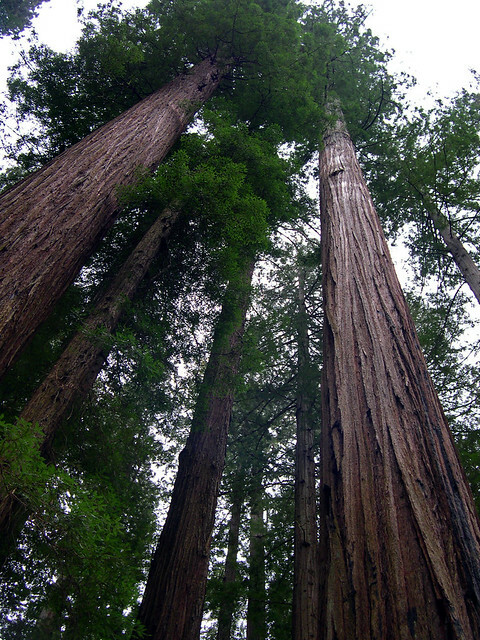 We drove north on 101 to the Avenue of the Giants which we when followed through its scenic meandering below the magnificent old growth redwood forests, with huge trees towering above the road. 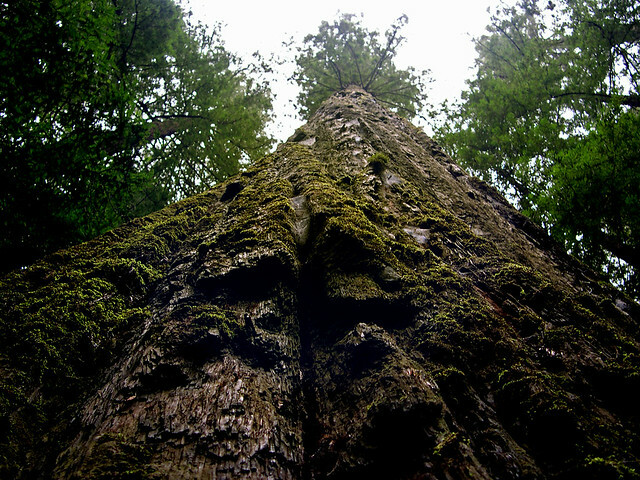 We stopped at a couple of small groves along the way to admire the trees and then stopped at the Founder's Grove where we saw the immense Founder's Tree and did a short walk along a marked trail to see some other aspects of the redwood forest. Some fellow tourists pointed out a huge banana slug sliming its ay across the walking path, and we stopped to get some pictures. It was gross, but fascinating. We continued along the Avenue of the Giants to a turnoff which led to the Rockefeller Grove, where we did another short loop trail walk, but it was not as well signposted or explained as the Founder's Grove walk. 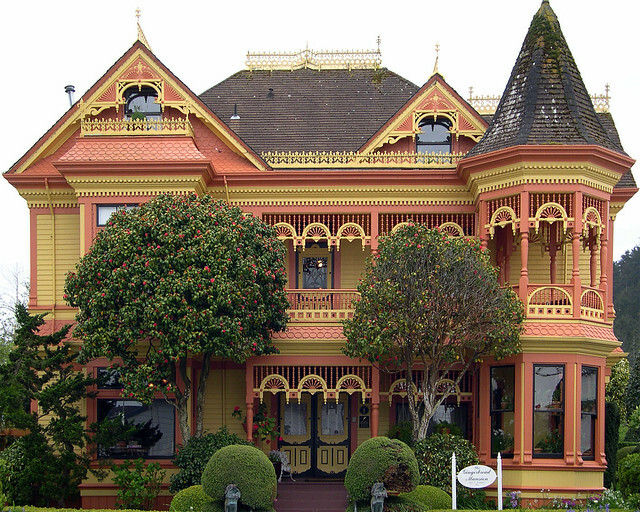 Driving further we left the Avenue of the Giants and rejoined 101 until we turned off for the historic town of Ferndale, where we wandered the street in the chilly overcast and admired the Victorian era buildings. We stopped at a soda fountain/diner for burgers for lunch - veggie for Michelle and chili for me. I also had a vanilla ice cream soda. Then we walked around admiring more of the old buildings, including the brightly painted Gingerbread Mansion bed and breakfast inn. We left Ferndale and drove straight through to Eureka, where we stopped in the historic Old Town section to walk around and see if we could find a photo place to burn my full memory card of photos to a CD. We didn't find any and asking in a store got us directions to the Long's store where we are now. After that long wait, there was some sort of problem with the photo CD burning machine and we couldn't get the CD after all! What a waste of time! We finally drove out of Eureka about 5pm and we headed north again on 101. We drove straight through to Orick and beyond, where we turned on to a side road to Lady Bird Johnson Grove. We thought it would be a short trail from the parking area, but it turned out to be a one mile trail with a walking time of an hour. Since it was cold and getting dark as the sun was setting behind thick cloud, we only walked about five minutes along the path and then turned back. Further along 101 we turned into a parking area designed to show us wild elk grazing in a field, and indeed we saw about 30-40 within 100 metres or so of where we stopped. They were a bit shaggy, as though shedding winter coats. 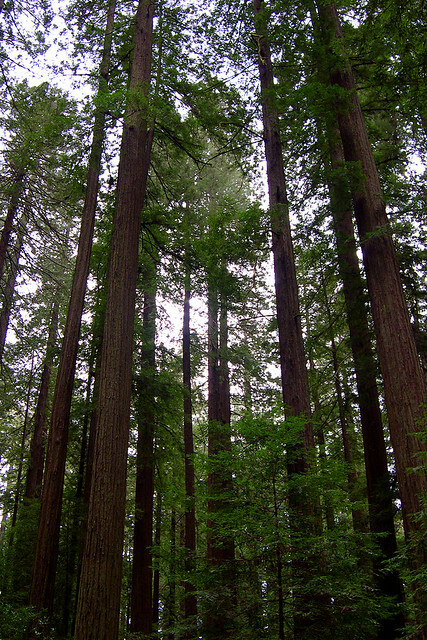 We continued driving north, turning off 101 on to Newton B. Drury Scenic Parkway, which was another beautiful scenic drive through old redwood forests, similar to the Avenue of the Giants, but not as long. Dusk was falling and the drive through the trees in the gloom was impressive in a different way. We drove on without stopping to reach Crescent City by nightfall and checked into the Super 8 Motel there. After unpacking, we drove over to a supermarket and bought a few supplies - I got some cream cheese to go on bagels we bought in Eureka's Old Town, which we had for dinner. It was nice to have a relatively light dinner for once, especially after the heavy lunch we had today. I also got some Ben & Jerry's Chocolate Chip Cookie Dough for afters. After eating the bagels, I went out across the highway from the motel to take some night photos of fishing boats in Crescent City Harbour. Then I came back and had my ice cream, which I didn't like very much - too much dough and not enough ice cream - before turning in for the night. Last updated: Thursday, 24 January, 2019; 00:18:29 PST.